We purchased this game as a part of our start of the school year treasure hunt (click here for more details about the treasure hunt). We have already enjoyed a family night where we all four played this game about 15 times in one evening. It’s addicting! This game follows the idea of the popular party game Mafia. In this role-playing card version, each player secretly looks at the card they are dealt to find out their role. There are many possibilities and each role has a certain job to do in the first phase of the game — which is NIGHT. The NIGHT phase can be announced by a person who doesn’t want to participate in the round, or you can also download this free app to make it possible for all players to participate in the round. During the NIGHT phase, players eyes are closed while the announcer (or app announcer) describes the steps each role should wake up and do. Players take turns in the night phase to either investigate who is a werewolf or work to confuse other players. For instance, a Seer would wake up (open their eyes) and look at another player’s card or two of the role cards not assigned to players. Some roles are considered on the werewolf team and some belong to the village team. The ultimate goal is to help your team win by voting to eliminate someone from the other team. This vote happens at the end of the DAY phase. 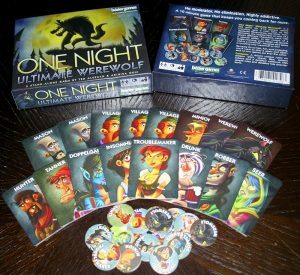 In the DAY phase, players talk out what happened in an effort to figure out who is the werewolf. Players can NOT look at their role card in the DAY phase, even though it may have changed in the NIGHT phase. Not everyone will be honest in this phase – especially those on the werewolf team. Also because no player really knows what their role is since cards were swapped during the NIGHT phase. Each player then votes to eliminate another player who they think is on the opposite team. The person who receives the most votes is eliminated and reveals their card to all players. If a werewolf is eliminated, the village team wins. But if a villager is eliminated, the werewolves win.